As the lights dimmed on the nearly 100-year old stage of Atlanta’s famed Fox Theatre, the familiar opening vocal sample of “22 (OVER S∞∞N)” beckoned from backstage the familiar face of Justin Vernon, indie rock’s foremost experimental traditionalist and the creative mastermind behind Bon Iver, a subtly impactful project now circling its first decade of existence. While it would risk doing an injustice to simply ponder over how important Vernon’s output has been to the blanket genre of “indie rock”, he and the current Bon Iver touring lineup make substantial work of arguing the case. The band powered through a six-song opening segment culling from 2016’s 22, A Million. The record, another sharp left turn in a discography consisting only of them, relies on heavily processed/AutoTuned vocals and engrossing but odd electronic arrangements. 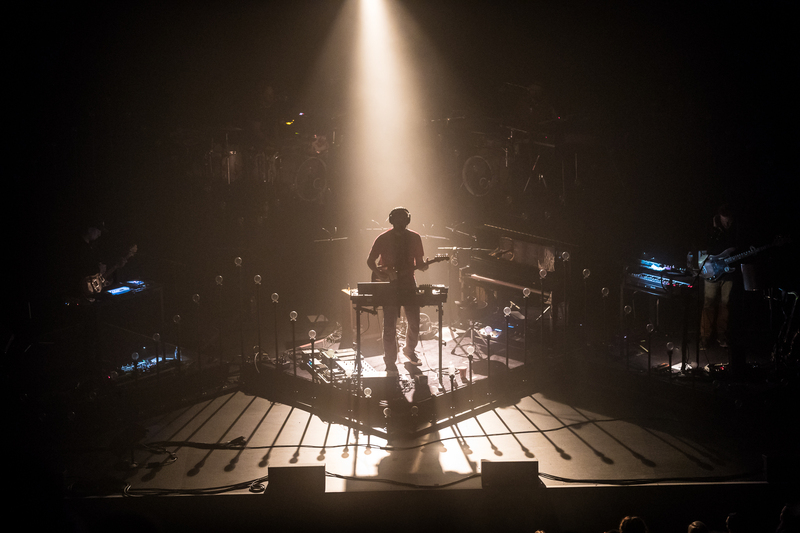 While the change from the hushed and isolated folk of notorious debut For Emma, Forever Ago and the lush, exacting pop structures of Bon Iver, Bon Iver initially threw longtime fans off the scent, the 22, A Million songs took on impressive size within the confines of the large theatre. That being said, much of the post-show chatter observed by this writer was altogether appreciative of the craft on display, but also wistful for a longer set heavier on the standards. Backed by a tasteful lighting program consisting of rich blues, synchronized strobes and illuminating spotlights, the music’s place as the star of the evening gave way to a very respectful audience engagement that seemed to only threaten a fever pitch in reaction to reprisals of songs from the band’s first two albums. Namely, the first signs of majority reaction (outside of routine applause between songs and following Vernon’s many breathtaking falsetto flourishes) in reaction to a set choice came for Bon Iver, Bon Iver opener “Perth”, a drum and brass-provoked number that still comes across as a marvel each time this writer listens to it. “Perth”, both on record and in this particular performance, goes into “Minnesota, WI.” Though this song raises the dramatic stakes laid forth by “Perth”, if the setlist had followed in further logical sequence with “Holocene” (the second most popular Bon Iver song by most measures), it may have led to an even more engaged, and more importantly, standing audience. It is possible that too much is being made of the fact that all fifteen songs of the main set were performed in this dynamic, of emphatic performers and quietly engaged crowd. It could be true that said dynamic bolstered the significance of thousands suddenly taking to their feet to cheer on a cathartic singalong encore of “Skinny Love” (the most popular Bon Iver song by all measures), but as someone who spent two consecutive hours standing for a performance by Wilco (in all fairness a much more rollicking band) with a similar amount of people at the very same venue just a month before, there has to be some sort of larger observation to be made here about the way crowds interact with the live space as it concerns this particular brand of music. It seems to be very much par for the course at shows of acts within the so-called “indie rock” world to find much of the paying ticketholders in an imagined competition of “who can most visibly convey their disinterest?” Although Vernon and his fellow musicians gave what I am sure is the same amount of effort they have been throughout this tour so far, I can only begin to imagine the potential dissonance of looking out from playing occasionally gigantic songs on an architecturally and culturally important stage at a mass of bodies just… sitting there. But again, this is all a digression to take away from the fact that Bon Iver is just as heartrending live as they are on record. In fact, they wield this power even more forcefully in a captive hall, with Vernon’s most stunning vocal turns coming on acapella numbers like “715 – CR∑∑KS” and the deep cut “Woods”, moments balanced out by the band getting to shine in multiple spots – the mournful trombone intro of “8 (circle)” and crashing down on a surprisingly loud, set closing rendition of “The Wolves (Acts I and II)”, among others. And though the full band efforts of Bon Iver, Bon Iver cuts such as “Holocene” and “Calgary” met warm receptions, it was the aforementioned For Emma songs that formed the one-two punch which closed the night which still hit the hardest. “The Wolves (Acts I and II)” and “Skinny Love” are as perfect of songs as really any songwriter has put forth over the course of popular American music, repetitive in the right places and from a place of raw emotion. Though Vernon spent much of his early years drawing as much ridicule as praise for being the soft folk guy who spent a winter in a cabin in the woods poring over these genuinely sad songs, time has vindicated him and the universal sentimentality and empathy of those otherwise personally felt narratives on For Emma. Before launching into “Skinny Love”, Vernon (falsely) claimed that the night of the performance marked the exact 10-year anniversary of the album’s release, a short aside that proved his staying power. For, to be reaching this milestone and having thousands of people singing back the words that you wrote at one point for yourself, has to be the ultimate humbling experience. While the Bon Iver project promises to continue to be one of experimentalism, it is almost certain that we have many more decades of Justin Vernon finding ways to gently lead us back to where it all began.